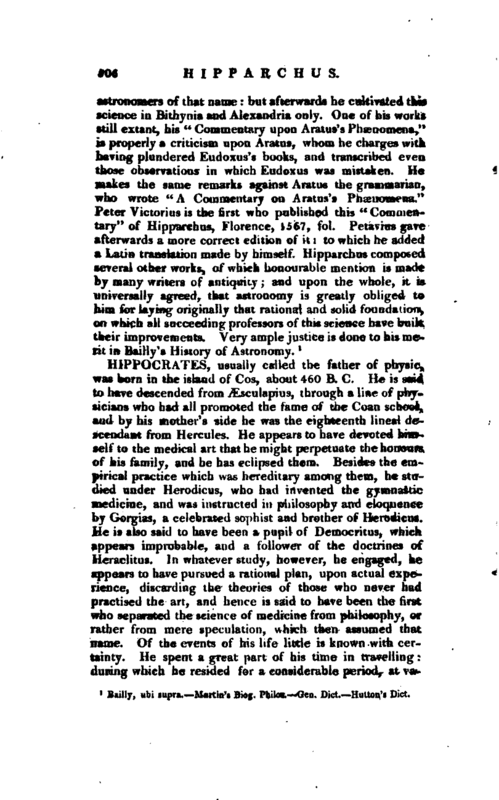 , usually called the father of physic, was born in the island of Cos, about 460 B. C. He is said to have descended from Æsculapius, through a line of physicians who had all promoted the fame of the Coan school, and by his mother’s side he was the eighteenth lineal descendant from Hercules. He appears to have devoted himself to the medical art that he might perpetuate the honours of his family, and he has eclipsed them. Besides the empirical practice which was hereditary among them, he studied under Herodicus, who had invented the gymnastic medicine, and was instructed in philosophy and eloquence by Gorgias, a celebrated sophist and brother of Herodicus. He is also said to have been a pupil of Democritus, which appears improbable, and a follower of the doctrines of Heraclitus. In whatever study, however, he engaged, he appears to have pursued a rational plan, upon actual expedience, discarding the theories of those who never had practised the art, and hence is said to have been the first who separated the science of medicine from philosophy, or rather from mere speculation, which then assumed that name. Of the events of his life little is known with cer T tainty. He spent a great part of his time in travelling: during which he resided for a considerable period, at | varipus places, in which he was occupied in the practise of his art. His chief abode was in the provinces of Thessaly and Thrace, especially at Larissa, the capital of Thessaly, where he composed several books. According to Soranus, he spent some time at the court of Macedon, where he signalized himself, in consultation with Kuryphon, a senior physician, by detecting the origin of the malady of the young Perdiccas. His observation of the emotion of the prince on the appearance of Phila, a mistress of his father, led him to pronounce that love alone was capable of curing the disease which it had occasioned. His fame caused him to receive invitations from diiFerent cities of Greece. He is said to have been requested by the inhabitants of Abciera to go and cure their celebrated fellowcitizen, Democritus, of the madness under which they supposed him to labour, whom he pronounced not mad; but, the wisest man in their city. In a speech ascribed to his son Thessalus, still extant, we are told that Illyria and Paeonia being ravaged by the plague, the inhabitants of those countries offered large sums of money to induce Hippocrates to come to their relief; but forseeing that the pestilence was likely to penetrate into Greece, he refused to quit his own country, but sent his two sons, and his sonin-law, through the diiFerent provinces, to convey the proper instructions for avoiding the infection; he himself went to Thessaly, and thence to Athens, where he conferred such eminent services on the citizens, that they issued a decree honouring him with a crown of gold, and initiating him and his family in the sacred mysteries of Ceres and Proserpine. 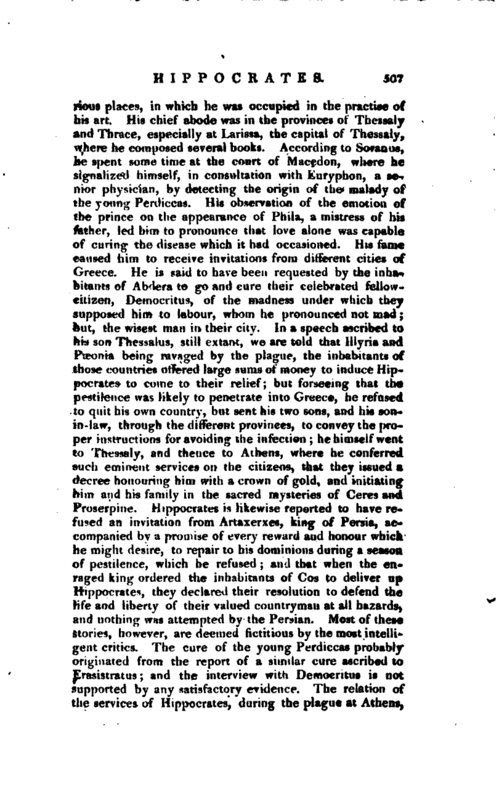 Hippocrates is likewise reported to have refused an invitation from Artaxerxes, king of Persia, accompanied by a promise of every reward and honour which he might desire, to repair to his dominions during a season of pestilence, which he refused; and that when the enraged king ordered the inhabitants of Cos to deliver up Hippocrates, they declared their resolution to defend the life and liberty of their valued countryman at all hazards, and nothing was attempted by the Persian. Most of these stories, however, are deemed fictitious by the most intelligent critics. The cure of the young Perdiccas probably originated from the report of a similar cure ascribed to Erasistratus; and the interview with Deraocntus is not supported by any satisfactory evidence. 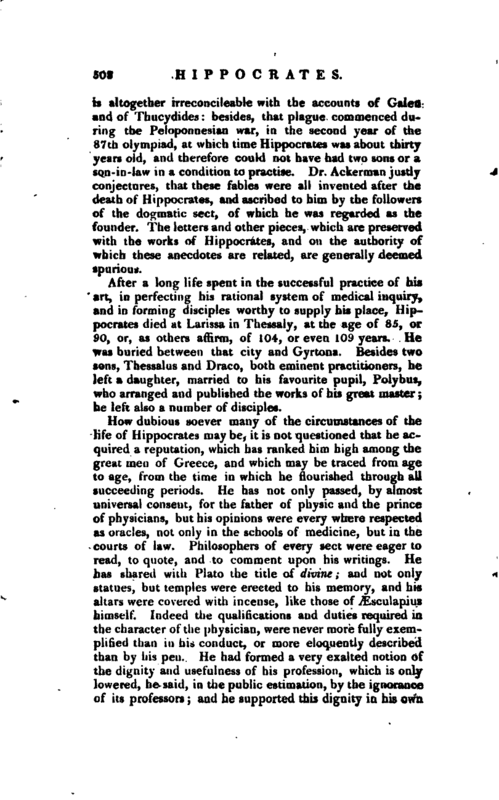 The relation of the services of Hippocrates, during the plague at Atbeps, | is altogether irreconcileable with the accounts of Galen and of Thucydides: besides, that plague commenced during the Peioponnesiin war, in the second year of the 87th olympiad, at which time Hippocrates was about thirty" years old, and therefore could not have had two sons or a son-in-law in a condition to practise. Dr. Ackerman justly conjectures, that these fables were all invented after the death of Hippocrates, and ascribed to him by the followers of the dogmatic sect, of which he was regarded as the founder. The letters and other pieces, which are preserved with the works of Hippocrates, and on the authority of which these anecdotes are related, are generally deemed spurious. After a long life spent in the successful practice of his art, in perfecting his rational system of medical inquiry, and in forming disciples worthy to supply his place, Hippocrates died t Larissa in Thessaly, at the age of 85, or 90, or, as others affirm, of 104, or even 109 years. He was buried between that city and Gyrtona. Besides two sons, Thessalus and Draco, both eminent practitioners, he left a dan g liter, married to his favourite pupil, Poly bus, who arranged and published the works of his great master; he left also a number of disciples. 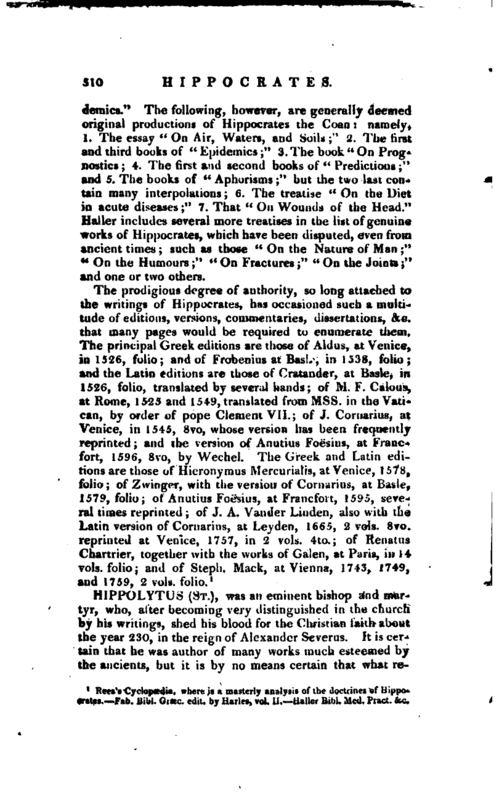 The books attributed to Hippocrates amount to sevemytwo in number, of which, however, a considerable part are regarded as spurious; some containing opinions which were not prevalent till long after the age of Hippocrates, and some differing altogether in style and composition from the genuine writings of that master, which are composed in the ionic dialect, and are distinguished by a remarkable conciseness, and, as it were, compression oflanguage, which at times, indeed, borders upon obscurity. Some pieces have been obviously written after the commencement of the Christian tera; and Galen affirms that several interpolations and alterations were made by Dioscorides and Artemidorus, surnamed Capito, in the time of Adrian. Polybus, the son-in-law of Hippocrates, who collected and edited his works, is believed to have written some of the pieces, and Thessalus and Draco, his sons, as well as Hippocrates III. and IV., his grandsons, are supposed to have written others, especially several of the books of | “Epidemies.” The following, however, are generally deemed original productions of Hippocrates the Coan namely, 1. The essay “On Air, Water*, and Soils” 2. The first and third books of “Epidemics” 3. The book On Prognostics 4. The fir&t and second books of “Predictions;” and 5. The books of “Aphorisms” but the two last contain many interpolations 6. The treatise *‘ On the Diet in acute diseases“7. That *’ On Wounds of the Head.” Haller includes several more treatises in the list of genuine works of Hippocrates, which have “been disputed, even from ancient times such as those” On the Nature of Man“”On the Humours;“”On Fractures;“”On the Joints;" tnd one or two others. 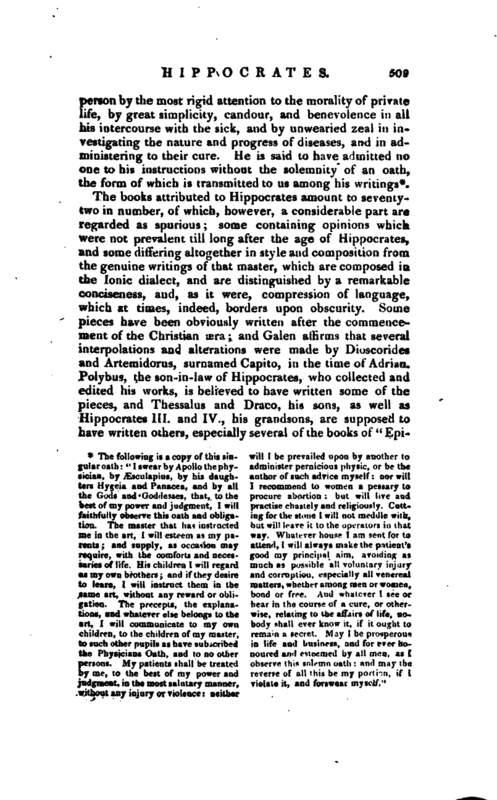 Rees’s Cyclopædia, where is a masterly analysis of the doctrines of Hippocrates. Fab. Bibl. Gvjbc, edit, by Harks, vol. II. —Haller BiW. Med. Pract. See.